Always keep soil samples out of direct sunlight and away from heat, preferably in a cooler. Soil Health Assessment samples need to be stored in a refrigerator or cold room after returning from field. 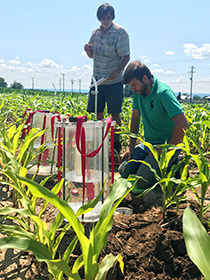 Make sure to send a completed Soil Health Submission form, in a Ziplock bag, that includes your penetrometer measurements (optional) with your sample. Use rapid shipping method, double Ziplock bag your soil sample and ship sample with blue ice packs during warm weather periods. 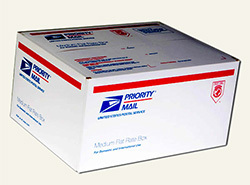 Use Small Flat Rate box or send up to four, 6-cup samples, using USPS Priority Mail Medium Flat Rate box. Beginning June 1 2016 each individual sample needs to be double bagged prior to packaging and shipping. Packing material such as crumpled paper or bubble wrap must be placed in the box with the samples to prevent sample movement and spillage during shipping. There are certain counties in the US where soil should neither be packaged nor shipped. Soil received from these counties will be destroyed without processing. For a complete list of prohibited counties please visit the Resources tab on our website. Note: Due to thousands of soil samples processed by our lab annually, we do not send confirmation upon receiving soil samples. If you require confirmation please track your package or include a note with your soil samples requesting confirmation.